Summer in Gatlinburg means that the hugely popular Tunes and Tales has begun, running from June 9 through August 12, 2017, and now in its 12th year. Highly talented musicians, performers, actors and artisans offer live music, storytelling and interaction in small performance groups at unknown spots along Parkway, starting at 6 pm each evening. Strolling Parkway in the evening is always great fun, but now you have to run the gauntlet of fun. See how far you can get during Tunes and Tales season without bumping into a cluster of strollers gathered around an unannounced, surprise performance of music, storytelling, or even clogging – want to learn to clog? Now’s your chance! Parkway comes literally alive with entertainment as flash-mob charm and street theater excitement take over, often with the sweet bluegrass sounds of fiddle, banjo, guitar and dulcimer filling the air. Performers, many dressed in period costume, bring Appalachian heritage to the street. Artisans sometimes show us how to whittle wood the expert way, cloggers show us how to do this tricky dance right, and storytellers bring history alive to our ears. Meanwhile, Zeno the costumed Gatlinburg bear frequently shows up to hand out cuddly bear hugs, and the performers especially love to engage children in their art and entertainment. You can never know where the entertainers will strike next along Parkway, but you can get a glimpse of who’s playing this season from the Tunes and Tales Facebook page. It’s a 7-week festival played out in small cameo appearances that seem to be aimed especially at you and your family, and give you memories to take away forever. It’s the personal touch, the hometown feel, the real life on the street – and it’s been long planned with auditions for this years performers held as far back as January. Sometimes you could watch horse-drawn wagons pull up on Parkway and groups of performers silently disperse to parts known only to them, getting their performance ready for the unsuspecting strollers. The festival takes a great pleasure in not letting you know what’s next, and the performers get their fun from seeing the smiles light up all around them. 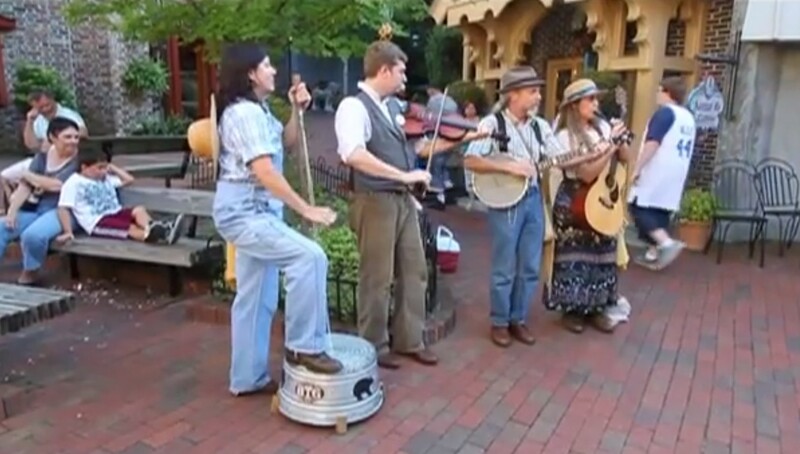 Stroll into Gatlinburg this summer and grab an unforeseeable slice of entertainment on the street of this fun loving town.